Within minutes after takeoff, the fire burned over the mountain, they said. Two firefighter pilots who rescued three people and their dogs off a California peak told ABC News the fire roaring toward the ridge would likely have killed the stranded group within minutes. The pilots had been making water drops on the Woolsey fire in Southern California, when their radio crackled with an urgent request to make their way to Castro Peak near Malibu. A number of people and pets were stranded there, they were told. The Los Angeles Fire Department released a video Monday that pilots Dave Nordquist and Joel Smith had taken Nov. 9 as they conducted the rescue mission. The Woolsey fire, which started Nov. 8 near Simi Valley in Ventura County, quickly spread to Los Angeles County -- at one point torching the equivalent of 80 football fields a minute. The fire, which has been blamed for the deaths of at least three people, is currently 98 percent contained, according to California Department of Forestry and Fire Protection. 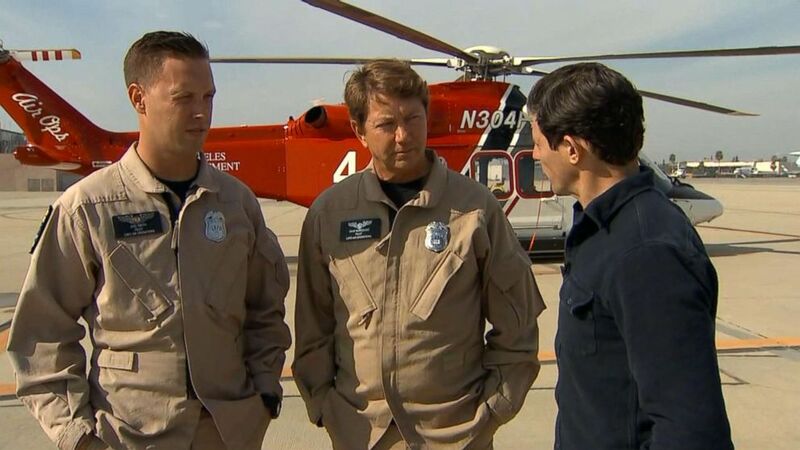 Nordquist, a 38-year veteran with the LAFD, told ABC News on Wednesday that he and Smith, a nearly 10-year veteran, were in the middle of dropping water on the the wildfire when a helicopter coordinator reached out to them, asking what their rescue capabilities were. Because the pair didn’t have a rescue team, they would be forced to land their multi-ton helicopter on that peak. 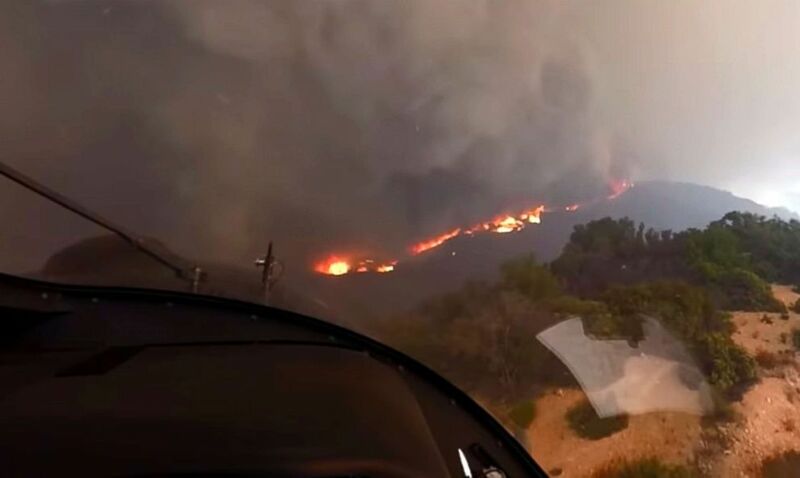 (David Nordquist/Los Angeles Fire Department via AP) In this Nov. 9, 2018 photo from video provided by the Los Angeles Fire Department, LAFD Air Operations pilot David Nordquist records flames approaching as he takes off after rescuing three people and two dogs from Castro Peak in the Santa Monica Mountains in Malibu, Calif. When he and Smith reached the area, Nordquist said he saw lots of smoke as well as some people and dogs on a mountain peak. Nordquist said the blaze was moving in the direction of the peak where the people were located -- and the entire area was engulfed in smoke. "We saw that they were inside of a paved area that was fenced in. ... We first tried to land in the area but it just didn't, it wasn't working for us so we took the next best thing and landed outside of it," Nordquist said. After Nordquist landed the helicopter, Smith jumped out. "Given the rate of [fire] spread that we saw -- and the best judgment call that I could make -- we probably had another five minutes to get the people out before it burned over the top," Smith told ABC News on Wednesday. "There was really nowhere to run, nowhere to go for these people." When Smith reached a woman and her dog, he said she appeared a bit confused and in shock, seeing a pilot and helicopter landing near them. "I don't think they realized how close the fire was to be honest with you. ... I said, 'We need, we need to go now. The fire's here. Is there anybody else up here?' And she said, 'There's two other gentlemen and there's another dog,'" Smith said. (ABC News) Los Angeles Fire Department pilots Dave Nordquist and Joel Smith rescued three people and two dogs on Nov. 9 off a peak in California as the Woolsey fire neared. Smith said that after some gentle nudging – and with the helicopter now low on fuel -- he was able to get the trio and their two dogs -- including a terrified English mastiff -- moving in the direction of the helicopter. "I [just said] 'Come with me. ... Your ride's leaving and we gotta go right now,'" he said. For a few seconds, the mastiff refused to budge. They had to shove him aboard. The two pilots said Wednesday that they'd heard reports that the fire had burned over the mountain peak almost 10 minutes after they'd left. The two never got the names of their passengers; they simple dropped them off and headed back to fight the fire. "God bless that we were in the right place at the right time," Smith said. Brian Humphrey, a spokesman for the LAFD, said neither the people nor the dogs were hurt, according to The Associated Press.